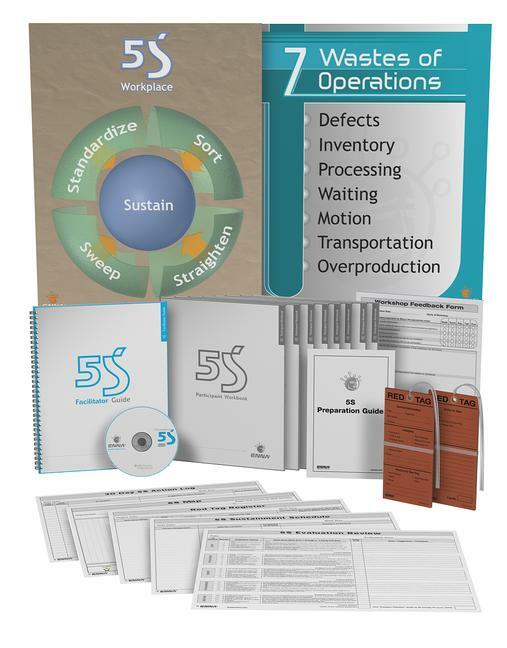 The 5S Solution Package has been designed both to train staff in the principles of 5S and create the understanding needed to commit to an organization-wide Lean Transformation. This comprehensive training package is action oriented to ensure the successful learning and communication of Lean Manufacturing Principles. A comprehensive, easy to use facilitator guide for training employees on the principles of 5S and steps for implementation. The guide contains a systematic approach to preparing and executing successful workshops in 5S and is included with the purchase of a solution package. It helps the first time trainer prepare for the event, is a reference manual for timing, scheduling, and the overall process of the workshop. Designed using Flash technology, the 5S presentation is a cut above anything that could be designed in PowerPoint. Latest technology in presentation format using dynamic formatting and projection of image and content. Designed with the participants in mind, this workbook will be used during the workshop and retained for reference. These workbooks combine information, illustrations, key questions, and space for note taking. Includes a self assessment form to test understanding of principles communicated during the workshop. An 11Ã—14 pad of forms that logs all items identified by red tagging. An 11Ã—14 pad of forms for the entry of action items to be implemented in the 5S area within the next 30 days. An 11Ã—14 pad of forms for recording a birds-eye view of the area for referencing layout and 5S related opportunities. An 11Ã—14 pad of forms for the scheduling ongoing activities to maintain 5S in an area until a permanent solution can be found. An 11Ã—14 pad of forms, for participants, managers, supervisor, or whoever is responsible for benchmarking and auditing 5S in an area on a periodic basis. These oversized 5S tags are designed with usefulness in mind. Large enough to record information but small enough to be useful, Ennaâ€™s 5S Red Tags allow for the control and structure of the sort step of 5S. Each Red Tag has been pre-threaded for ease of use. A full color visual aid to be used during training and posted in work areas as a reference to the 5S principles. A full color visual aid to be used during 5S training and posted in work areas to remind staff to continuously eliminate waste.